Home > Divisions > U.M.P. Modifieds > Michael Long takes win at Tri-City Speedway’s Modified Mania Finale! Michael Long takes win at Tri-City Speedway’s Modified Mania Finale! Pontoon Beach, IL (September 25th, 2010) Michael Long of Quincy, Illinois brought home the victory on the final night of Tri-City Speedway’s Modified Mania. Long originally was to start the main event on the outside of the front row, but after he a pole sitter Chad Kinder had a bad attempt at the original start, they were moved back to the second row. Kevin Weaver and Shelby Miles would move up to the front row for the start and it was Weaver setting the pace for the first twelve laps. It didn’t take long for Michael Long to move in on Weaver for the lead and the two battled for the top spot for several laps before Long finally took over the top spot. Long would then pull away by several car lengths. Chad Kinder would take over the second spot just a few laps later and would give chase to Long for the lead. Kinder slowly reeled in Long and was right on his rear bumper as they took the white flag. Kinder then fell back going into turns one and two but then picked up the pace and once again closed right in on Long through turns three and four. Long would win the race with Kinder’s right front alongside Long’s left rear quarter panel. Kinder was asked after the race why he lost so much ground going into turns one and two and he replied he thought the race was over on the white flag lap. In victory lane, Long stated the engine in his machine is an old reliable motor he has had for five years now and this was the 29th race on that engine this season without any type of refresh done on it. Mike Harrison had a great run as he charged through the field to finish in the third spot after starting way back in the fifteenth starting spot. Harrison needed a late race caution to close the gap as he was just too far back of the top two after working his way to the third spot. Jeff Leka would take the fourth position while Kevin Weaver rounded out the top five. 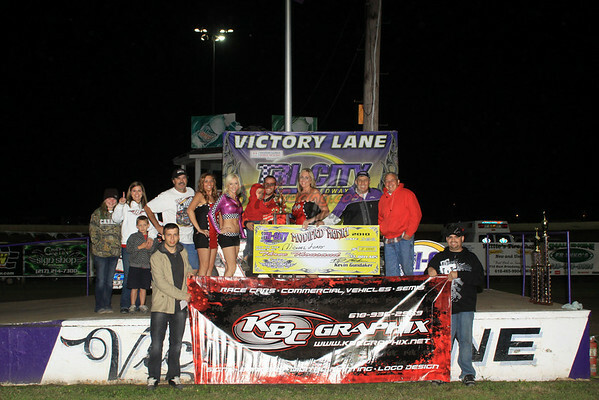 CLICK HERE FOR MORE PHOTOS FROM TRI-CITY SPEEDWAY!